Myrmecodia pendans is the Latin name for SARANG SEMUT. There are 71 species of Myrmecodia but the one that can be use as medicine is Myrmecodia pendans with an average size of 25 cm in diameter and 45cm in height. Sarang Semut grows on host trees with height more than 8 meters located 1,100 to 2,500 meters above sea level at the mountains Jaya Wijaya. This Sarang Semut has already been well known by Southeast Asia people. The ants nesting in it has a unique shape, black-bodied red headed. Because of its uniqueness then Mr. Hendro Saputro gave it the name Sarang Semut which is then become popular in Indonesia. Uniqueness of Sarang Semut (Myrmecodia pendans) lies in the interaction of ants that nest in the tubes of the fruit. The stable temperature inside the fruit is making the ant colony stay in this plant. In the long term there is a natural chemical reaction between the compounds produced by the ants with the substances contained in the fruit, where the roots itself doesn’t serves as an absorber of nutrients, but just as binding on its host tree only. 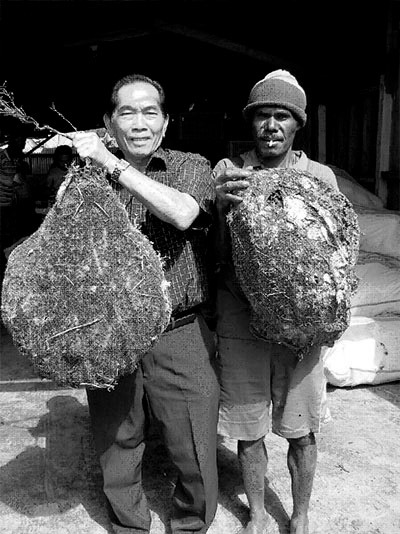 This nest is utilized and processed by Mr. Hendro into herbal medicine. We found no negative side effects from Sarang Semut but instead it can improve the human body’s metabolism, improve blood circulation thus increasing stamina. Alpha-tocopherol– It is a strong antioxidant with IC50 values ​​obtained 5,1ppm numbers. This means that the concentration of antioxidants can inhibit free radicals by 50%. Polyphenols – It is as anti-microbial and can reduce blood sugar levels. Inhibitors of histone deacetylase (HDAC), shown to inhibit tumor cell growth, induce diffentiation, and causes apoptotic cell death of cancer cells, and HDAC inhibitors cause transcriptional activation of several genes whose expression led to inhibition of tumor growth. After knowing the active substances content then we carried out the in vitro TOXICITY testing for Myrmecodia pendans, and the result shows that although we increase the doses 400 times higher than the recommended dose, it is still safe. So Sarang Semut LD50 figures are so high that consumers are securely protected. A recent study by researchers from the university of Malaysian and university Szeged, Hungary, indicating the Sarang Semut extract contains compounds which have multidrug resistance reversal activity with fluorescence activity ratio value of 39.72. It’s very important because most cancer cells have the ability to become resistant to different drugs. Flavonoid content is very susceptible to the heat so the production process must be very careful, not too hot. Drying temperature in the drying oven should be set at the right temperature. After the drying process it was continued with the gamma ray radiation in order to kill the remaining germs / bacteria so that it become completely sterile. Therefore, it is not recommended to consume Sarang Semut which are only processed by drying through solar heat because the temperature is not stable, so the levels of fungi, and bacteria that grow on the fruit become very high, especially if the outer skin of Myrmecodia pendans is not peeled but immediately sliced ​​and dried. The skin of Sarang Semut have been examined by Mr. Ahkam, it contained harmful substances that are formed from the reaction of natural air and therefore should not be consumed because it will cause negative effects leading into poisoning. Sarang Semut in the form of slabs also not recommended for consumption, because the active substance content on each plate are uneven, so consuming the slab does not represent the correct dosage. An efficient form of Sarang Semut is in capsule form, by means of testing the free radical 1,1-diphenyl-2-pikrilhidrazil (DPPH) with inhibitory concentration (IC50) between 28-49 ppm. If purified then the extract antioxidant activity of each compound isolates become low. However, the production process must use extraction technology that has qualify CPOTB standards (The correct process of traditional Medicine) and using the water extracts -based materials. Many people do not understand or knowing what is the process of extraction, but it is absolutely a must do if you want to get the juice from the Sarang Semut. Do not put raw powder into the capsule because the powder will not be dissolved in the digestive process but it will settle and interfere the work of vital organs such as the kidneys. Before selling the product widely in the market, Sarang Semut have passed the final test by BPOM (the Food and Drug Administration) and obtained the license with Registration Number POM TR 102 320 151. For the treatment of severe disease : 3 times, 1-2 capsules per day. For minor deseases : 2 times, 1-2 capsules per day. To prevent and improve stamina : 1 times daily 1 capsule. The dose for children under 10 years, half the adult dose. Myrmecodia Pendans adalah nama latin untuk SARANG SEMUT. Spesies Myrmecodia ada 71 spesies namun yang berkhasiat adalah jenis Myrmecodia Pendans dengan ukuran rata-rata berdiameter 25 cm dan tinggi 45cm. Sarang semut tumbuh pada pohon inang setinggi 8 meter berada 1100-2500 dari permukaan laut di pegunungan Jaya Wijaya, dan sudah dikenal oleh masyarakat local Asia Tenggara. Semut yang bersarang didalamnya pun bentuknya unik, berkepala merah berbadan hitam. Karena keunikannya inilah yang menarik perhatian Bapak Hendro Saputro sehingga beliau memberinya nama yang kemudian popular di Indonesia dengan sebutan SARANG SEMUT. Keunikan SARANG SEMUT (Myrmecodia Pendans) terletak pada interaksi semut yang bersarang pada umbi yang terdapat lorong-lorong didalamnya. Kestabilan suhu didalamnya membuat koloni semut betah berlama-lama bersarang didalam tanaman ini. Dalam jangka waktu yang lama terjadilah reaksi kimia secara alami antara senyawa yang dikeluarkan semut dengan zat yang terkandung didalam buah SARANG SEMUT, dimana akarnya sendiri sama sekali tidah berfungsi sebagai penyerap unsur hara, hanya sebagai pengikat terhadap pohon inangnya saja. Benalu berbentuk bonggol inilah yang dimanfaatkan Bapak Hendro untuk diolah menjadi obat. Tidak ditemukan efek samping yang negatif dari SARANG SEMUT tetapi justru dapat memperbaiki metabolisme tubuh, melancarkan peredaran darah sehingga stamina meningkat. ► Untuk pengobatan : minumlah secara teratur 2-3 gelas sehari. ► Untuk pencegahan dan meningkatkan stamina : Minumlah secara teratur 1-2 kali sehari. ► Dosis untuk anak-anak dibawah 10 tahun, setengah dari takaran dewasa. Setiap takaran hanya untuk satu kali pemakaian. Sebaiknya tidak menggunakan panci alumunium.